Who is the Macbook Pro 13 ideal for? Anyone who wants a laptop that offers great performance, with an outstanding display, great sound quality, an excellent backlit keyboard and trackpad, that’s solid, light weight, without the bulk, price nor requirement of the higher performance of the Macbook Pro 15. What is the Macbook Pro 13 good for? – Listening to music as well watching TV/movies from local files or streaming. – Audio/photo/video editing. Are you a pro working with heavy files and demanding programs? You may want to consider the more powerful Macbook Pro 15. The Macbook Pro 13 can handle most workloads, except for the most demanding audio, photo, video and 3D editing, which run more smoothly on the more powerful Macbook Pro 15, which is equipped with a six-core CPU, up to 32GB of RAM and a dedicated graphic card. The Macbook Pro 13.3″, Retina display, solid, reliable, .59″ thick and 3lbs. – Outstanding display: 2560 x 1600 13.3″ Retina, high maximum brightness (500 nits) and a calibrated IPS panel for accurate colors with DCI P3 color space support and great viewing angles. – Very high performance PCIe SSD storage makes your Macbook feel more responsive, is reliable and shock resistant. – Better performance than the Macbook 12: Dual-core CPUs with much higher frequencies, resulting in better performance. – Only 3 lbs and 0.59″ thick. Nearly as light and thin as the Macbook Air 13, but far more powerful! – It’s an Apple computer: macOS, Time Machine backup, many built-in apps, highly reliable, excellent customer service. – Outstanding speakers: They get very loud, have great dynamic range and solid bass. It doesn’t get much better than that on a 13″ class laptop. – Very quiet: The fan is hardly audible, unless you push the CPU to 100% for a long time. – Limited amount of ports: 2 or 4 Thunderbolt 3/USB Type-C is all you get. You’ll most likely require an adapter (dongle), USB hub or a dock for your older USB Type-A devices, memory cards and such. – Great, but not the best CPU performance: The Macbook Pro 13.3″ Mid 2018 is equipped with a quad-core CPU. Fine for photo/video editing, heavy multitasking or demanding programs where high sustained CPU performance is required, but for the best performance, the Macbook Pro 15 Mid 2018, with its six-core CPU, is what you want. – Limited GPU (video card) performance. Not ideal for fast video editing or 3D rendering: you want the Macbook Pro 15 with its dedicated video card for that. – Webcam is still limited to 720p HD (1280 x 720, 0.9 Megapixels). Come on Apple, this is 2018 and it’s disappointing when compared to the Ipad or Iphone. – No LAN RJ-45 port. You can a USB adapter for 10/100 speed, or a Thunderbolt adapter for Gigabit speed. – No optical drive. Normal on a 13″ laptop. You can get an external USB powered optical drive, if you want to. – Maximum amount of RAM is 16GB: It’s not bad, but it could be limitation for some users now and especially in the future. 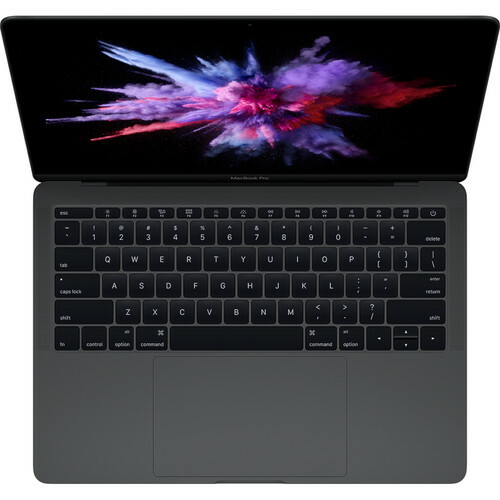 The Macbook Pro 15 Mid 2018 is available with 32GB. – The Macbook Pro 13 RAM cannot be upgraded: It’s soldered. – The SSD storage cannot be be upgraded on the Macbook Pro 13 with touchbar: it’s soldered. – SSD storage can be upgraded only on the non-touchbar models, if you can find a SSD that fits the proprietary connector, have the right tools, don’t mind following a guide to disassemble your Macbook Pro and a guide to copy your data. Far faster CPU, improved graphics, True Tone, quieter keyboard and more! 1. Massively higher performance CPU: You get the newer, higher performance, 8th generation Intel Core CPU architecture, Coffee Lake. With a move from a dual-core to a quad-core CPU, Apple is obviously touting a 2x performance improvement. These new CPUs can also boost to higher frequencies – the top-end i7-8559U goes up to 4.5GHz. So performance should be improved in all cases, even in those that can’t take advantage of the additional cores. 2. Higher performance graphics: You now get Intel Iris Plus 655 instead of the Intel Iris 650. While the number of execution units is unchanged, at 48, maximum frequency is now 1200MHz instead of 1100MHz and you get twice the eDRAM cache memory, with 128MB instead of 64MB. 4. True Tone: True Tone display technology automatically adjusts white balance to match the color temperature of the surround light. 5. Updated coprocessor chip: Apple’s T2 brings support for “Hey Siri” which will allow you to invoke the digital assistant by speaking instead of hitting a specific key combo. The T2 is also Apple’s SSD controller, so this means that the MBP 13 Mid-2018 is getting a SSD upgrade and it also means that said storage is now always encrypted. 6. A quieter and more dust resistant keyboard, protected by a thin silicone layer, as discovered by iFixit. According to them, “dust largely stays around the exterior of the new silicone shield, but particles can make their way past the barrier over time.” Keycaps are changed, making them easier to remove without breaking the mechanism. MacRumors has leaked an internal document from Apple Authorized Service Providers confirming that the purpose of the keyboard membrane is to “prevent debris from entering the butterfly mechanism.” Note that Apple now offers a 4 years warranty on the keyboard of all Macbooks equipped with the older buttlerfly keyboard without that membrane. 7. Support for the Blackmagic eGPU standalone external graphic unit. It comes with a Radeon Pro 580 graphics card with 8GB of video memory, with two Thunderbolt 3 and one HDMI output, allowing you to connect two external displays. It’s also a USB hub with four USB-A 3.1 ports and a charger with 85 watts of power delivery. It’s available directly from Apple. Screen: 2560 x 1600 13.3″ Retina display, with an IPS panel for accurate colors and great viewing angles and True Tone technology. Storage: High performance PCI-Express based SSDs (Solid State Drive) storage. This offers you a better computer experience because it responds to your inputs much more quickly. Programs launch far more quickly, the Operating System starts in seconds and resumes from sleep instantaneously. No noise, no vibration, higher reliability and higher resistance to shocks. See the SSD FAQ for more details on SSDs. Ports: 4 x Thunderbolt 3 (USB Type-C) Ports, 3.5mm combo jack. OS: macOS High Sierra, with many built-in apps. Windows through Bootcamp, if needed. The difference is in the base and Turbo clock frequencies (speed). Higher frequencies (number in GHz) mean higher performance. Unsure about how whether you want 256GB, 512GB, 1TB or 2TB (1024GB) of storage? It depends on what you intend to do with your Macbook Pro. If you only use your MacBook Pro to run a few basic programs at once, like email, some Excel, Word, a web browser, and iTunes, 8GB is plenty of memory. If you intend on keeping your Macbook Pro for many years, going with 16GB is a good idea, seeing as memory usage keeps increasing, with newer versions of programs using more and more memory. Keep in mind that the memory is soldered in the Macbook Pro computer, so you cannot add memory to upgrade your computer. It’s available in either Silver or Space Grey. Is it safe to buy a Mac from B&H Photo Video instead of the Apple Store? B&H Photo Video is an Authorized Apple Reseller. That means B&H has received authorization from Apple to sell Macs, iPods, etc. This is great for you because B&H prices are generally much lower than the Apple Store. Items ship promptly and you receive the same warranty as if you had made the purchase at the Apple Store. In fact, you still receive all the benefits of the Apple Store (classes, Genius Bar access, etc.) when you buy from B&H Photo Video. So really, the only difference between buying from B&H and the Apple Store is that with B&H you will probably save a lot of money! Screen: 2560 x 1600 13.3″ Retina display, with an IPS panel for accurate colors and great viewing angles. OS: macOS Sierra, with many built-in apps. Windows through Bootcamp, if needed. You have the choice of buying your Macbook 13 Mid-2017 with the Touch Bar or the classic row of function keys (F1, F2, etc.). The Touch Bar is basically a thin and wide touchscreen above the number row, with useful shortcuts that are based on the app that you are using, that can be customized as you wish. On the far right side, it features a touch ID sensor, for secure login and secure purchases. Some people love it, some people hate it. I think that it’s a matter of getting used to it, so that it becomes a second nature to take advantage of it. That said, it’s optional on the Mid-2017 Macbook Pro 13, so you can choose to get it or not. Be aware that having a touch bar or not also affects 4 other things on the Mid 2017 models! Models with the touch bar have twice the number (4x) Thunderbolt 3 (USB Type-C) Ports, while the models without the touch bar are limited to two Thunderbolt 3 (USB Type-C) Ports. Keep in mind that charging your Macbook uses one of those ports. Models without the touch bar are limited to lower performance CPUs, while models with the touch bar are equipped with higher performance CPUs. See the section below for more details about this. Models with the touch bar are equipped with faster Intel Iris Plus 650 GPU, while models without the touch bar are equipped with the Intel Iris Plus 640 GPU. Finally, the models with the touch bar are more expensive than the ones without it. You see, depending on whether you choose a Macbook Pro 13 Mid-2017 with or without a touch bar, it will be equipped with different CPUs. Basically, the models that are equipped with the touch bar offers higher CPU performance, with significantly higher base frequencies. Unsure about how whether you want 128GB, 256GB, 512GB or 1TB (1024GB) of storage? I hope that you’ve enjoyed this article on how you can choose the best Macbook Pro 13. Do you have any feedback or any questions? Are you unsure which Macbook Pro 13 is the best one for you?